The Oriental Insurance Company Ltd. is planning to conduct a recruitment examination in the year 2018 for the posts of assistants. OICL Assistant 2018 Official Notification will be released in the coming months. Here you will find important information about this recruitment examination such as important dates (tentative), eligibility criteria, application fee & process, admit card, result, cut-off etc. The Oriental Insurance Company Ltd. also known as OICL is a well-known government owned general insurance company in India. The company’s headquarter is located in New Delhi, India and have more than 1800 active branches and 30 regional offices across the nation. Note – Abbreviations used in above table are- ST- Scheduled Tribe, SC- Scheduled Caste, OBC- Other Backward Community and PwD- Persons with Disabilities. OICL Assistant 2018 interested candidates must have a graduation degree in any discipline from a recognized University/college/institute OR candidate passed in XII or equivalent examination with 60% marks (for SC/ST/PwD candidates- 50%) and English as one of the subjects at any of the following levels- graduation/intermediate/high school and have knowledge of state language from which he/she is applying. A candidate want to apply for OICL Assistant 2018 examination has to pay a fee of Rs 500/- as his/her application fee (includes intimation charges as well) along with applicable bank charges. Employees of OICL/Ex-Ser/PwD/SC/ST candidates have to pay only intimation charges (50 Rs), no application fee for them. Candidates of all the categories are required to know that only online fee will be accepted by OICL. Candidates can pay their application fee (if applicable) by using a national debit or credit card. They can also make payment through net banking. How To Apply for OICL Assistant 2018 Recruitment Examination? OICL Assistant 2018 question paper will be available in both Hindi and English language (except for the English section). Total time duration will be 120 minutes. Reasoning- Seating arrangement, syllogism, coded inequalities, blood relation, coding, decoding, number series, clocks & calendars, streams & boast etc. English Language- Cloze test, reading comprehension, sentence correction/paragraph completion, synonyms & antonyms, phrase substitution, one word substitution, paragraph jumbles, spotting errors etc. General Awareness- National/international events & current affairs, countries name & their capitals, Indian budget & 5-years plans, sports, books name & their authors, science- discoveries & inventions, important days, general science, common abbreviations, Indian history & economy etc. Numerical Ability- Logarithms, average, arithmetic (number theory), H.C.F. & L.C.M., cube roots, square roots, ratio & proportion, simplification, fractions & decimals, chain rule, variation, mensuration- areas & volumes, simple & compound interest etc. Computer Knowledge- History of computer, computer languages, internet, computer network & types, computer hardware & software, types of computer, computer arithmetic etc. All the candidates have to download their call letters/admit cards from the OICL’s website. The Oriental Insurance Company Ltd. will intimate candidates to download their admit cards by sending them an email or SMS. How To Download OICL Assistant 2018 Admit Card? Note- All the candidates have to bring an original photo ID along with their admit card to the examination centre. This year, the Oriental Insurance Company Ltd. will conduct Assistant recruitment examination in the following cities/towns- Guwahati, Nellore, Kurnool, Tirupati, Guntoor, Ongole, Vishakapatnam, Vijaywada, Amravati, Ahmednagar, Nasik, Aurangabad, Pune, Nagpur, Mumbai, Alwar, Sikar, Kota, Udaipur, Ajmer, Bikaner, Jodhpur, Jaipur, Surat, Faridabad, Palwal, Gurgaon, Vadodara, Gandhinagar, Patiala, Ropar, Fathehgarh Sahib, Jalandhar, Mohali, Bhatinda, Ludhiana, Amritsar, Ujjain, Satna, Jabalpur, Gwalior, Indore, Silvasa, Vapi, Durgapur, Asansol, Bidar, Mysore, Kozhikode, Kollam, Jammu, Srinagar, Ranchi, Lucknow, Kanpur, Allahabad, Agartala etc. 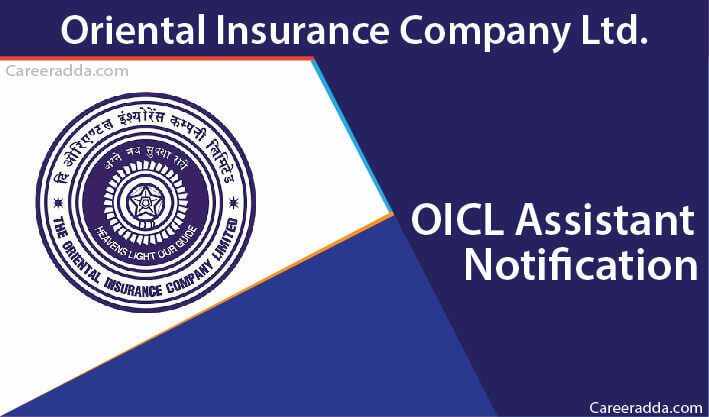 It is expected that the Oriental Insurance Company Ltd. will declare OICL Assistant 2018 result after 2 or 3 weeks from the date of the examination. All the OICL Assistant 2018 aspirants are recommended to check OICL’s website regularly to get latest updates on OICL Assistant 2018 recruitment examination. The Oriental Insurance Company Ltd. will publish final cut-off marks on its website. Candidates qualified in written examination will have to appear in computer proficiency test. Wish you all the best for your success.